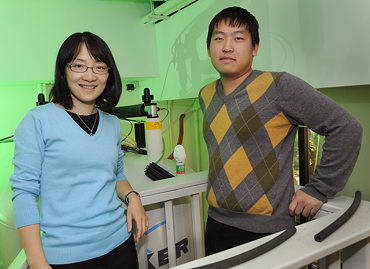 Mei Hong of Iowa State University and the Ames Laboratory, left, and Fanghao Hu of Iowa State used solid-state nuclear magnetic resonance spectroscopy to investigate the proton channel that connects a flu virus to a healthy cell. Photo by Bob Elbert. The findings are published in the Oct. 22 issue of the journal Science. Hong, an Iowa State professor of chemistry and an associate of the U.S. Department of Energy’s Ames Laboratory, said her research team used solid-state nuclear magnetic resonance (NMR) spectroscopy to determine the structure and workings of the proton channel that connects the flu virus to a healthy cell. She said a full understanding of that mechanism could help medical researchers design drugs that stop protons from moving through the channel. That proton channel is an important part of the life cycle of a flu virus. The virus begins an infection by attaching itself to a healthy cell. The healthy cell surrounds the virus and takes it inside through a process called endocytosis. Once inside the cell, the virus uses a protein called M2 to open a channel. Protons from the healthy cell flow through the channel into the virus and raise its acidity. That triggers the release of the virus’ genetic material into the healthy cell. The virus then hijacks the healthy cell’s resources to replicate itself. Hong and her research team – Fanghao Hu, an Iowa State doctoral student in chemistry; and Wenbin Luo, a former Iowa State doctoral student who is now a spectroscopist research associate at Penn State University – focused their attention on the structure and dynamics of the proton-selective amino acid residue, a histidine in the transmembrane part of the protein, to determine how the channel conducts protons. Their work was supported by grants from the National Science Foundation and the National Institutes of Health. ● A “shutter” channel that expands at the charged histidine because of electrostatic repulsion, thus allowing a continuous hydrogen-bonded water chain that takes protons into the virus. ● Or a “shuttle” model featuring histidine rings that rearrange their structure in some way to capture protons and relay them inside. Hong’s research team found that the histidine rings reorient by 45 degrees more than 50,000 times per second in the open state, but are immobile in the closed state. The energy barrier for the open-state ring motion agrees well with the energy barrier for proton conduction, which suggests that the M2 channel dynamically shuttles the protons into the virus. The chemists also found that the histidine residue forms multiple hydrogen bonds with water, which helps it to dissociate the extra proton. The research not only provided atomic details of the proton-conducting apparatus of the flu virus, but also demonstrated the abilities of solid-state NMR.